Genuine Dermaroller™ therapy encourages natural skin regeneration and scar repair to provide the necessary improvements in an individual’s skin. The genuine Dermaroller™ treatment uses a unique micro-medical skin-needling system that effectively stimulates the skin to regenerate safely and repair itself –so that smoother, younger-looking skin that looks vibrant can be the result. The skin conditions that can be remedied with the Genuine Dermaroller™ therapy includes facial lines or wrinkles, any skin damage caused by the harmful rays of the sun, acne scars, pigmented lesions, and stretch marks. The Genuine Dermaroller™ therapy is designed to be used only by trained practitioners, in authorised Genuine Dermaroller™ clinics. Woodbury Dental and Laser Clinic in Kent is an authorised Genuine Dermaroller™ clinic, so you can be sure that you are getting the excellent skin regeneration system and care that your skin needs from a trusted professional. The Genuine Dermaroller™ therapy will be administered or performed by a qualified Woodbury Dental and Laser Clinic practitioner in Kent. The practitioner will use a topical anaesthetic to numb the area where the Dermaroller™ therapy will be done; the anaesthesia will take about 30 minutes to take full effect. The Genuine Dermaroller™ will then work to produce columns in the skin through thousands of medical micro-needles, with each column successfully penetrating into the skin layer. Each of the columns will approximately be 0.1mm wide, and will close or recover very quickly for rapid skin healing – it is expected that the column will close within the same day. The entire Genuine Dermaroller™ therapy procedure (excluding the time it takes for the anaesthesia to take full effect) will take approximately 20-30 minutes. After the Genuine Dermaroller™ therapy treatment, the cells below the surface of the dermis will slowly start to repair itself and regenerate. The regeneration process will proceed slowly as new collagen is produced, blood supply is improved, and new cells are formed. Visible signs of regeneration and repair are expected to be seen roughly six weeks after the Genuine Dermaroller™ therapy, with the process continuing to show visible and long-lasting signs of skin improvement in the months following the first few weeks after the treatment is finished. 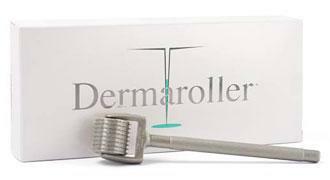 In general, skin conditions will be treated with three sessions of the Genuine Dermaroller™ therapy, with an interval of six weeks between each session. However, for skin conditions that involve scarring (such as acne scar problems) – the number of treatment sessions may be increased up to five. Acne scars – Skin that has been damaged by scarring can look unattractive and pitted. The Genuine Dermaroller™ therapy works to encourage the regeneration of new cells, so that the skin marred by scars will show improvement after a few sessions. Pigmentation and Sun-Damaged Skin – Too much exposure to the sun’s harmful rays can cause pigmentation lesions (such as freckles and age spots), which can make the skin look blemished or unclear. Genuine Dermaroller™ therapy works to repair the damage caused by overexposure to the sun – and helps remove the blemishes and pigmentation lesions on the skin. Lines / Wrinkles on Face and Chest – Natural ageing tends to slow down the production of collagen, which in turn causes the skin to lose elasticity. Lines on the face and the chest area, as well as wrinkles, can make a person look much older than his or her actual age. Genuine Dermaroller™ therapy works to encourage new collagen formation, so that facial and chest lines or wrinkles can be smoothened out once more – bringing out more vibrant, more youthful looking skin. Stretch Marks – Unsightly stretch marks are often the result of rapid stretching of the skin associated with accompanying rapid body growth; this skin problem can also be caused by hormonal changes. The Genuine Dermaroller™ therapy works to generate new cells and form new collagen, so that unsightly stretch marks can fade away after just a few treatment sessions.